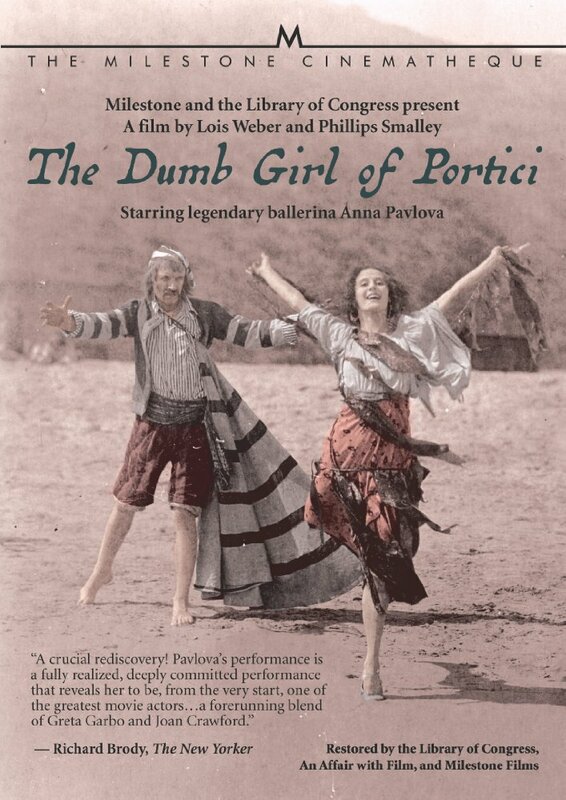 One highlight of the recently concluded San Francisco Silent Film Festival was the Library of Congress restored presentation of pioneering director Lois Weber’s powerful historic epic The Dumb Girl of Portici (1916), starring world-acclaimed ballet dancer Anna Pavlova in her only film role. Anna portrays a speechless fisher-girl seduced and abandoned by a Spanish nobleman in a tale set during the 17th century peasant uprising against Hapsburg’s occupation of Naples. Dr. Schloesser posing before his second, larger, castle home. Photo – Dr. Lisa Stein Haven. 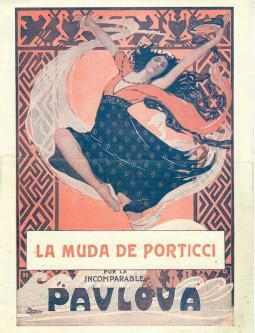 Much of the lavish production was filmed on giant sets built at the once rural Universal Studios backlot, where the Monte Carlo casino set from Foolish Wives (1922) and the cathedral set from The Hunchback of Notre Dame (1923) would later stand. But other scenes staged at the nobleman’s palace had a familiar look. 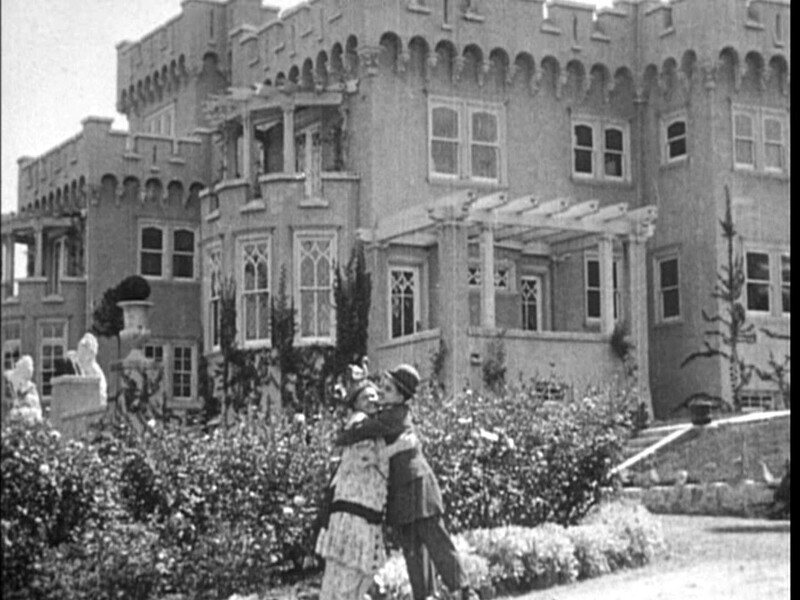 It turns out Charlie Chaplin and Marie Dressler had filmed there two years earlier in Tillie’s Punctured Romance (1914), Hollywood’s first feature length comedy, when they quickly marry after incorrectly assuming Marie has inherited her uncle’s fabulous estate. Note the prominent marble lions (above) discussed below. The trellis garden at left above appears in the background of this scene from TDGOP, while Charlie and Marie revel at the entrance gate to the right. HollywoodPhotographs.com. Mary Kornman at the Sans Souci front door in the Our Gang short Mary Queen of Tots (1925). 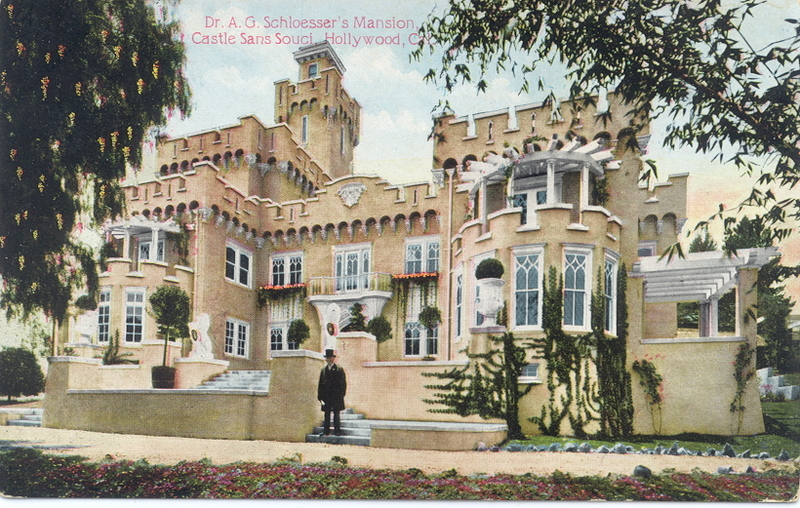 The home featured in both films was Castle Sans Souci, owned by Dr. A.G.R. Schloesser, formerly located at 1901 Argyle in Hollywood. Set in the foothills on a former lemon grove, the castle commanded a breathtaking view, especially from its six-story tower. Designed by architects Dennis & Farwell, the castle incorporated elements from ancient structures at Oxford, the Castle Glengarry in Scotland, and the Neurenberg Castle in Germany. The castle doorway (above) was an exact copy of the entrance to the city hall in Bremen, Germany, while the entrance was guarded by two Carrara marble lions, prominently visible in both films, which once stood guard over the Palace of the Doges in Venice for nearly 150 years before being shipped to Hollywood. The baronial entrance hall measured 50 x 25 feet, and was finished in oak, with a heavily beamed ceiling 25 feet above the floor, a massive stone fireplace, and a row of niches housing suits of armor. The elaborate grounds were designed by Nils Emitslof, the former landscape artist for the Czar of Russia. 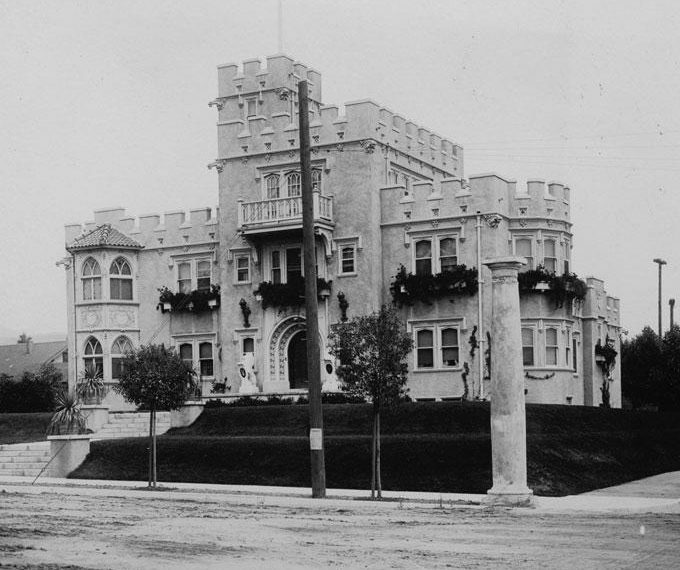 Castle Glengarry – USC Digital Library. Once a practicing physician, Dr. Schloesser made his fortune in mining and real estate investments, becoming a prominent Hollywood booster, capitalist, and art connoisseur. Traveling the world, Dr. Schloesser collected a gallery of medieval paintings, tapestries, and statuary. Before building Castle Sans Souci in 1912, Dr. Schloesser built a similarly styled castle home four years earlier across the street at 1904 Argyle, known locally as Castle Glengarry, that would later become home to noted silent film star Sessue Hiyakawa. Responding to anti-German sentiment during the First World War, Dr. Schloesser, whose name means “castle” in English, legally changed his name to Dr. Castles, a fitting self tribute to his heritage and to two of Hollywood’s greatest now-lost landmarks. A closer view of the Sans Souci gate – Photo Tommy Dangcil. Remarkably, Scottish comedian Billie Ritchie, who also played a tramp-like film character, shot Almost a Scandal (1915) at Castle Sans Souci, after Chaplin, but before Lois Weber. These scenes below show the back of the entrance gate at left, and another view north of the porch with one of the marble lions. A link to Ritchie’s film appears at the end of this post. Billie Ritchie in Almost a Scandal – EYE Filmmuseum. Click to enlarge – looking north – Castle Sans Souci and Castle Glengarry on Argyle, with Charlie and Marie beside the Sans Souci gate. The dotted line marks the trolley line, left to right, up Vine, across Yucca, up Argyle, and across Franklin, where Harold Lloyd filmed his Girl Shy trolley stunts. The lower left corner of Vine and Yucca is now the site of the iconic Capitol Records Building. The nearby “S”-shaped Pacific Electric rail line curves (see dotted line above), running west on Franklin, south on Argyle, west on Ivar, and then south on Vine, was the setting for Harold Lloyd’s trolley stunt scenes in Girl Shy (1923), discussed in this post HERE. Thanks to Dennis Doros and Milestone Films for the frame grabs from The Dumb Girl of Portici, slated to be released this fall. Tillie’s Punctured Romance is available as part of the Chaplin at Keystone DVD collection from Flicker Alley. You can read more about Charlie filming at Castle Sans Souci in my Chaplin film location book Silent Traces. 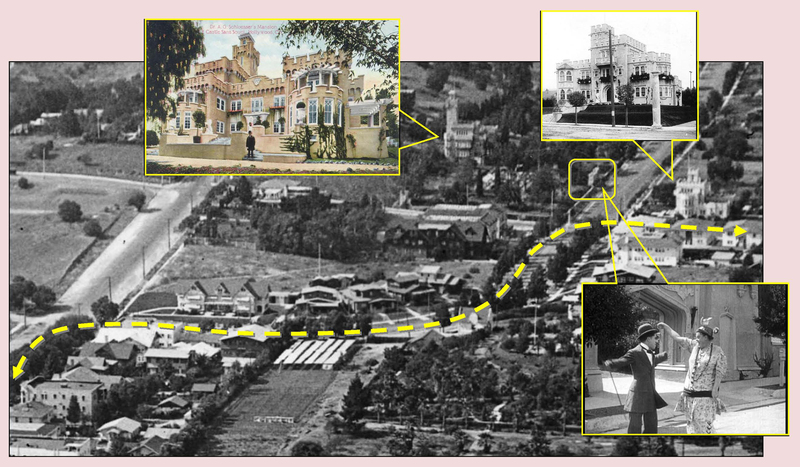 Castle Sans Souci was demolished in 1928 to make way for the aptly named Castle Argyle Apartments, still standing now perilously close to the later Hollywood freeway, while Castle Glengarry held on until 1956, replaced by the Capitol Gardens Apartments, both shown today on Google Street View below. The EYE Film Institute of the Netherlands has posted Almost a Scandal (1915) on YouTube, with the Castle Sans Souci scenes starting at 11:20. The opening scenes at 0:25 are filmed at the former Hollywood Bank at the SW corner of Hollywood Boulevard and Cahuenga, the same corner also appearing in Tillie’s Punctured Romance. 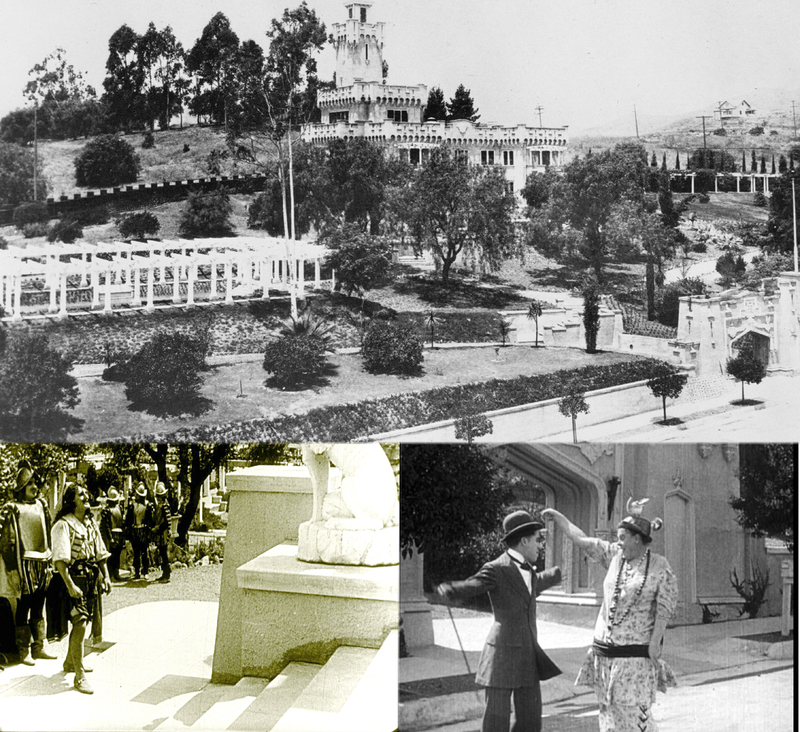 This entry was posted in Charlie Chaplin, Lois Weber and tagged Anna Pavlova, Argyle, Castle Glengarry, Castle Sans Souci, Charlie Chaplin, Hollywood, Lois Weber, Silent Comedians, Silent Comedies, Silent Movie Locations, Silent Movies, The Dumb Girl of Portici, then and now, Tillie's Punctured Romance. Bookmark the permalink. Fabulous, as always, John! I’ve done tons of research on both Castle San Souci and Glengarry and never knew about Pavlova. Bravo!!! Next time we talk, I’ll share the mystery of those lions. You’re going to keep me in suspense about those lions?!? 🙂 I noticed they originally stood guard in the Castle Glengarry photo before being moved to Sans Souci. I would hope that they were preserved when Sans Souci was demolished. Are there ANY interior shots of The Castle Mansions?! I haven’t seen any anywhere! Hello! I read in a book by Gregory Paul Williams that the old gardener Henry, live on the dilapidated Sans Souci after the doctors death, and that the castle was slowly deteriorating. So it seems it was still there when The Argyle Arms were built! Hello, I have 2 interior shots of castle San Souci. The amazing Gothic hall, the Louis XV Drawing Room. I also have one of the whole castle from the outside.